Event: Total Lunar Eclipse – full moon moves through the earth’s shadow. When: Tuesday, 21 December, 1:33 a.m. to 5:01 a.m.
Visibility: Throughout North America (eclipse begins at 10:33 p.m. Monday night on the west coast). What Will You See: Beginning at 2:41 a.m., the moon will take on a deep red color. The color is caused by sunlight bending through the earth’s atmosphere. The color will begin on the left side of the moon and creep across the surface, completely immersing the moon in a deep red color. Duration: The entire event lasts 4 hours, 28 minutes. The most visible portion (totality) begins at 2:41 a.m. and ends at 3:53 a.m. Mid-eclipse occurs at 3:17 a.m.
How Should It Be Viewed? 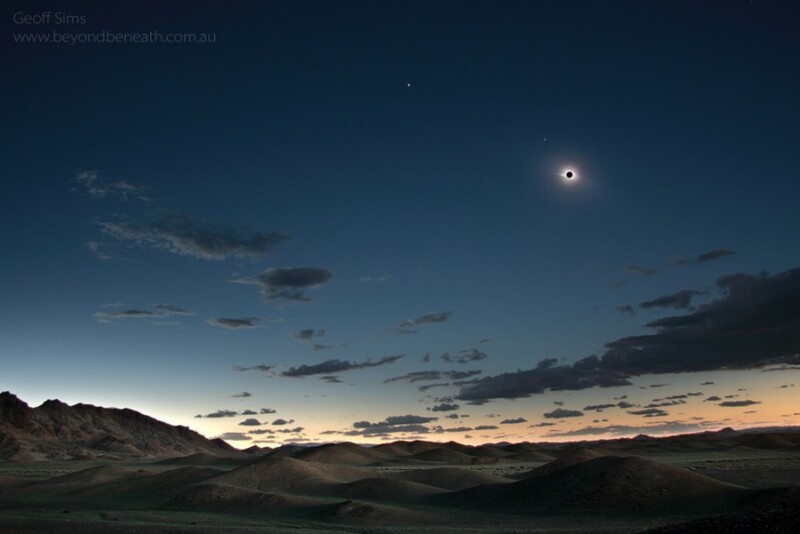 : Lunar eclipses can be viewed directly without filters, telescopes or binoculars. If you have a telescope, you can watch as specific craters are engulfed in darkness. Other important equipment includes a reclining lawn chair, blankets, layered clothing, insulated boots, hot chocolate, binoculars (if available). Look for the moon high in the west. What’s Happening? : The earth constantly creates a shadow that extends out into space from the night side of earth. As the moon orbits the earth, it occasionally passes through the earth’s shadow. The event begins as the moon first touches the edge of the Earth’s shadow at 1:33 a.m., and ends as the moon finally leaves the shadow at 5:01 a.m. If the entire disk if the moon passes through the darkest portion of the earth’s shadow, called the umbra, the event is called a total lunar eclipse such as we’ll see on the 21st. If only part of the moon passes through the umbra, the event is called a partial lunar eclipse. If the moon passes through the lighter portion of the earth’s shadow, the penumbra, we call the event a penumbral lunar eclipse and not much color is seen. Don't want to be up all night? Just check for clear skies at 2:15 a.m. If it's clear, stay up until 4 a.m. to see the full maximum of the eclipse. Then go back to bed and catch a few winks before you have to get up for the day! Be sure to check your weather conditions. The eclipse cannot be seen through clouds! Last TLE : February 21, 2008; Next TLE in this region: April 15, 2014. Ph: 215 448 1234, fax: 215 448 1188, e-mail: dpitts@fi.edu.